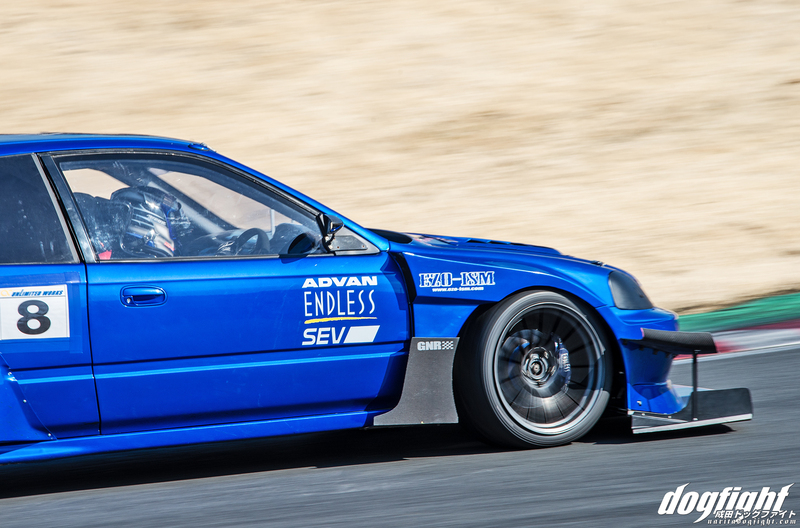 A little over a year ago, towards the end of the 2017 season, Asao Yasuji and the GNR Racing EK9 had a completely subdued look in comparison to their 2019 car; which now sports an array of upgraded aerodynamic pieces. 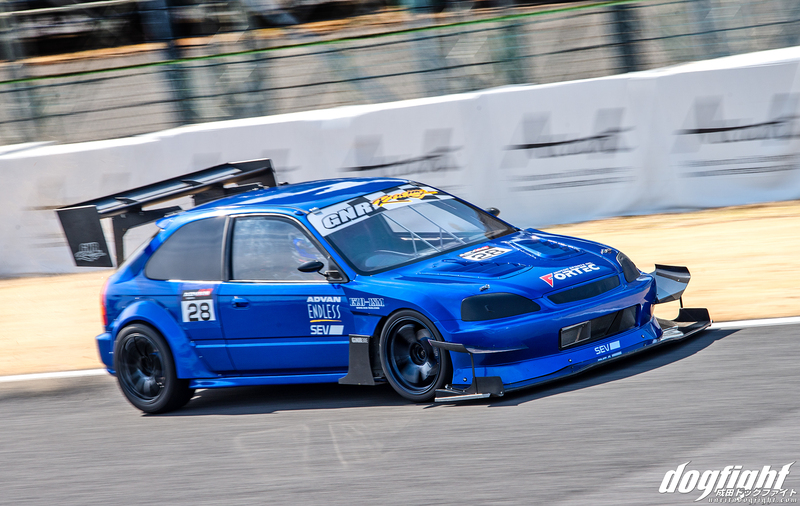 The car was technically still a stock-bodied EK aside from the custom fenders that allowed them to fit a larger front tire. 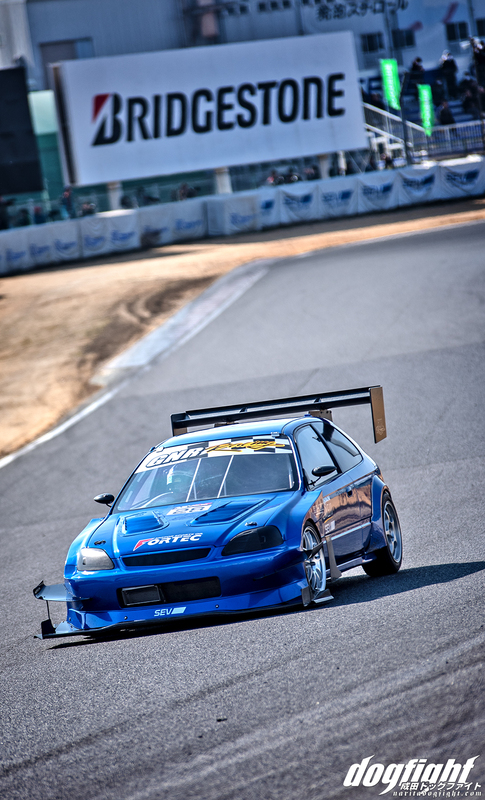 The owner of GNR being a good friend of Yasuji’s has allowed him to take the car to the next level, and despite living in the Sapporo area, has provided him opportunities to frequent Tsukuba Circuit; the benchmark of time attack tracks in Japan. For 2019 the team has been focusing on both weight reduction and improving the aerodynamics of the car in order to better match the power of the K24 they have sitting under the bonnet. You may recognize the rear over fenders being the same as the ones that adorned Tokue’s EK before the crash. After talking to Kubo and Iwata a few weeks ago, I learned that they made these in-house. The rear wing has been stepped up to a dual element with much larger end plates. The custom, chassis mount being reinforced just a bit more to ensure they can handle the added downforce. The front fenders remain the same, but the front end as a whole has gotten a much more aggressive treatment to it to better suit the widened front. 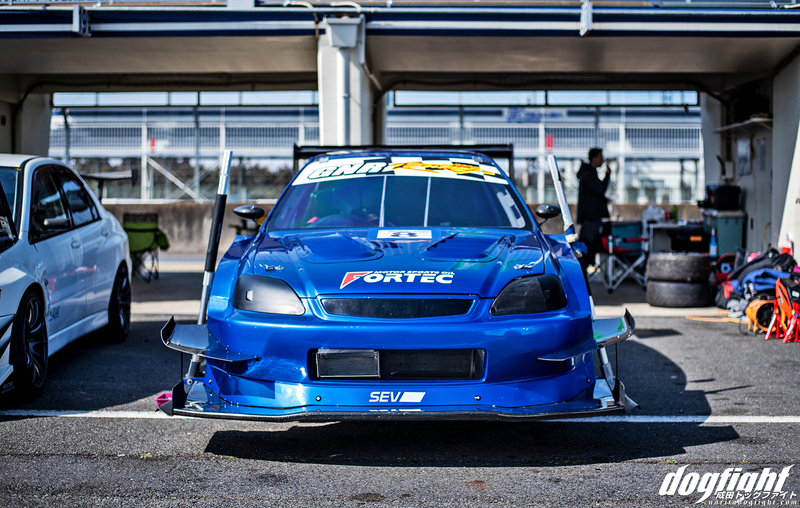 The new front end, which now sports a much larger splitter and canard setup from Sighthound and Under Suzuki’s carbon lineup, balances the car out much better than previously. 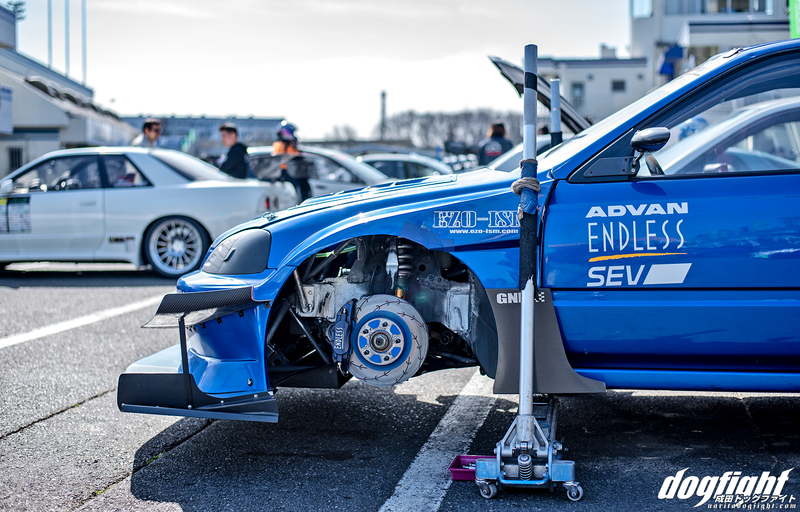 The custom fenders have never had an issue with fitting massive rubber underneath, but the 295 series tires they have equipped now fit perfectly, and provide more than enough grip at the cars present stage of development. Relaying data on car feel is important to the team, and something Yasuji takes very seriously. Download sessions after every event are analyzed to find time in each sector. 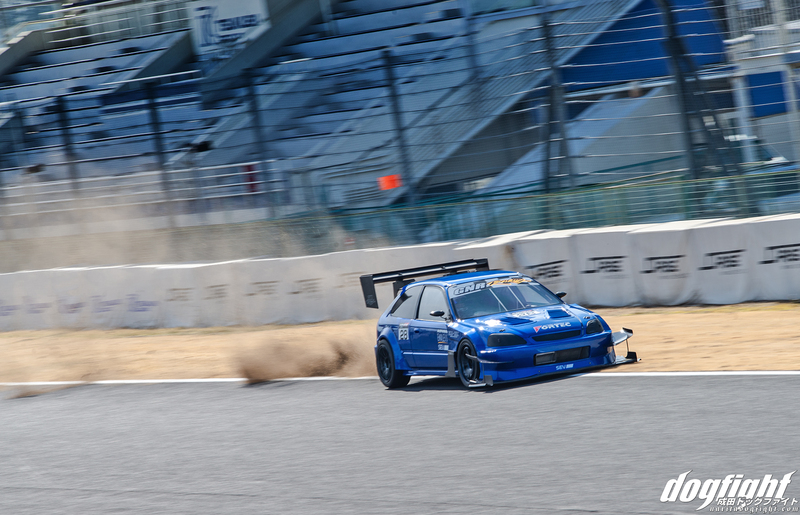 On track, Koji-san was driving the car to it’s limits. Pushing corner entry to speeds the pair have yet to see in any past event. 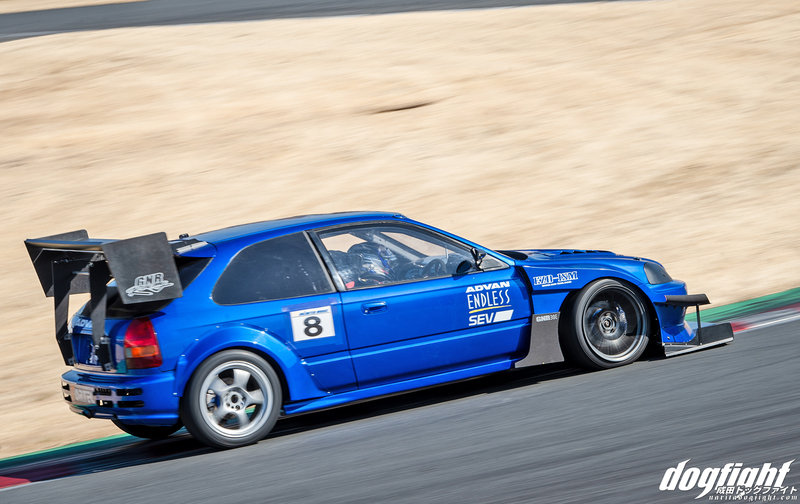 The car sounded amazing out of turn one and flat out through the esses heading into the first hairpin. 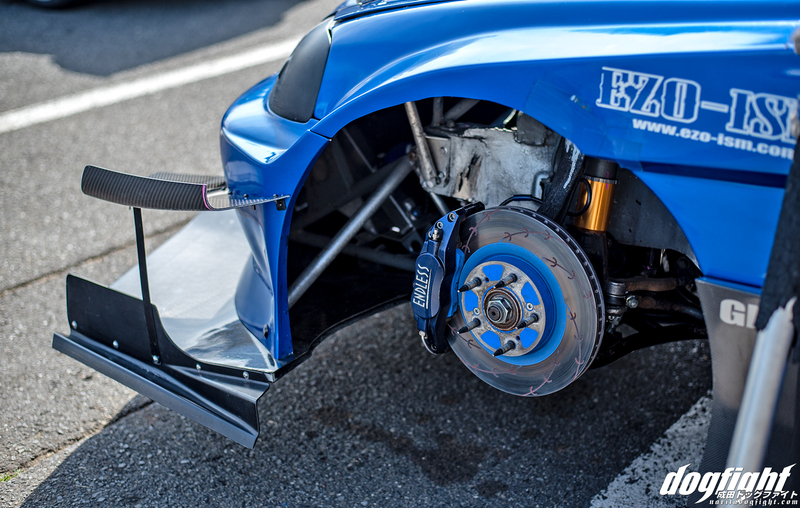 The car lifts the inside rear tire around the hairpin as the load shifts to the front right, laying the splitter flat on the track. The stiff springs mated to the custom valved Ohlins coilvers have been perfected over the past seven years of the cars life. This year they also looked into custom arms to improve their ability to tune the suspension, as well as reduce some unnecessary weight; a move straight out of the Garage Work playbook. Looking perfect headed around the first hairpin. Headed through the Dunlop turn and into 80R, Yasuji is able to stay flat out through the end of Sector 2. Running dangerously wide exiting the sweeper at the end of sector 3, akin to Sebastian Vettel on turn 11 during Australian Grand Prix qualifying this weekend. Staying on it though, the pair is able to cross the line with a 57.823 for Attack, awarding him with the title of the third fastest FF NA time of the day. That time, although very fast, is a failure in the eyes of the Yasuji and the GNR team as they’ve already broken into the coveted 56 second range. A 56.738 during February’s Zummy event leaves them hot on the heels of drivers like Horiton of Aslan and Ryo of Yellow Factory. With the limited amount of track time, accepting that you aren’t as competitive as you should be is a hard pill to swallow in Attack; especially when you’re traveling over 1,000 kilometers to compete. The over 30 hour round trip drive is no small commitment for the GNR team, and a testament to how dedicated they are to winning at this track. The steps the team have taken over the past year to improve the car are showing in the times to be working however, and they have no intention of slowing down development. The front end is looking more and more refined each time I see this car. 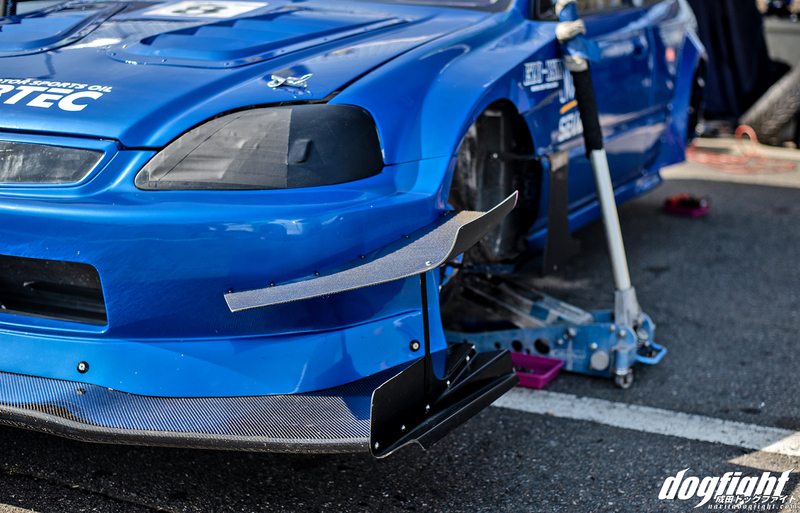 A full custom radiator support greatly reduces weight ahead of the frame rails. This is quickly becoming the norm for any serious FF car. 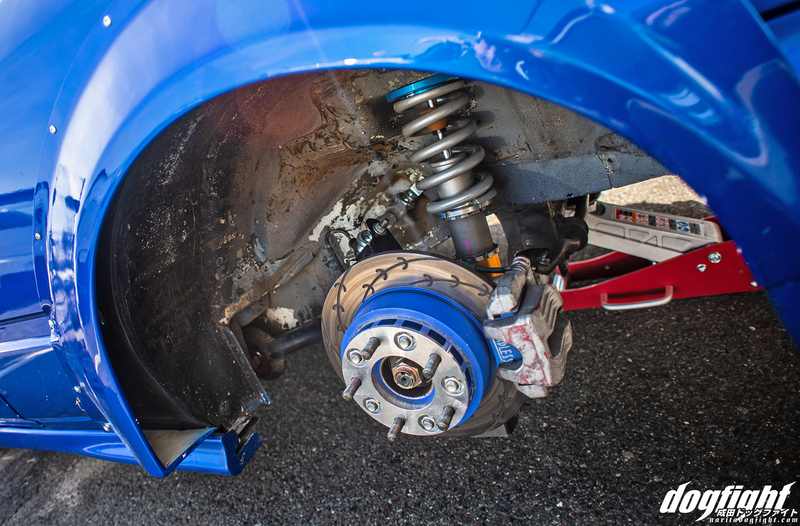 Endless calipers and rotors are tasked with slowing the car on entry. The overall look of the car has been transformed and now has a very nice balance that flows throughout the entirety of the car. In talking with Yasuji, the engine that powers the car is still a fairly mildly tuned K24. Even so, the 280 horsepower that it puts out is more than enough for the times they’re looking for. Could they add more power? Sure, but the car isn’t at that point yet. 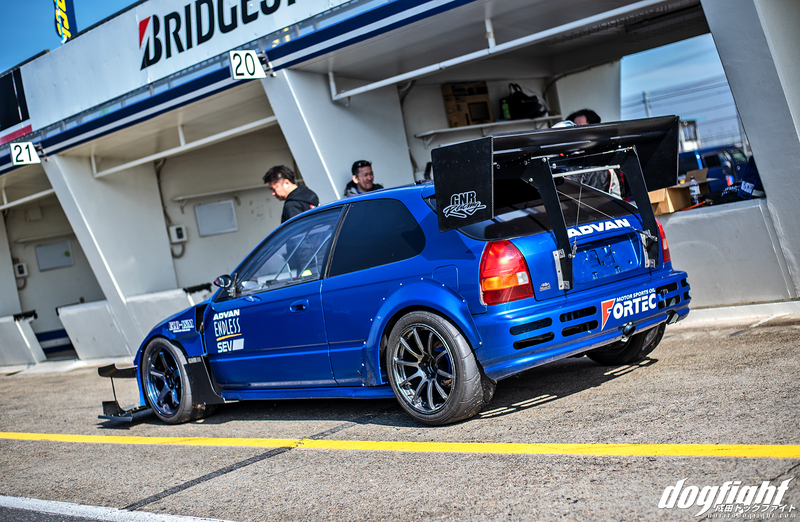 The entire ethos of Japanese tuning has always been to never overpower the chassis. For an 880 kilogram car, the 280hp mark is near perfect in the team’s eyes. It really has been cool seeing the progress. This is a team and driver to watch closely over the coming year, as they are right on the cusp of record breaking drives. Pushing the envelope of what a NA FF car can do with the rest of the frontrunners in the field. 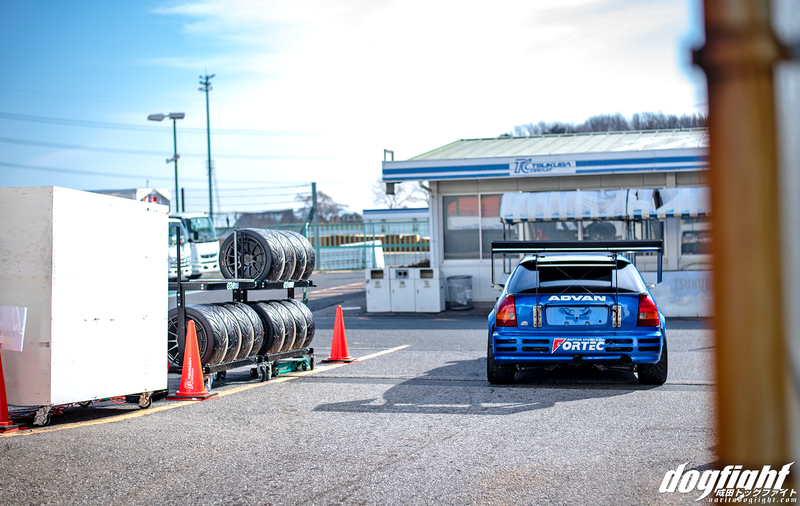 Their call is one for all of Japan to take note that the tuning shops of Hokkaido are here to wage war. This car from the north island? Really like what they did with the aero on this machine, 57’s and high 56’s aren’t bad for this build / motor combo. I am aiming to get out there mid year – if you can hit me up re: GNR’s shop details and a contact there either here on the blog or twitter (@nipponrunblog) I’d be grateful.